A reliable source for Miniature Linear Actuators information and a resource for accessing leading Miniature Linear Actuators and suppliers. Miniature linear actuators are a type of linear actuator that is manufactured on a much smaller-scale than the typical linear actuator size. Also referred to as micro linear actuators or mini linear actuators, miniature linear actuators produce mechanical linear motion through the conversion of various forms of energy into mechanical energy. Miniature Linear Actuators Miniature linear actuators are a type of linear actuator that is manufactured on a much smaller-scale than the typical linear actuator size. Also referred to as micro linear actuators or mini linear actuators, miniature linear actuators produce mechanical linear motion through the conversion of various forms of energy into mechanical energy. Various motor choices for miniature linear actuators include stepper, brushed DC, or brushless servomotors. Design system flexibility is determined by the anticipated specification revisions. Miniature linear actuators are used in a wide range of applications including robotics, aerospace, factory automation, and a wide range of engineering applications. They can also be found in industries such as automotive, industrial manufacturing, aviation, agriculture, construction medical, optical, and semi-conductor equipment. Miniature Linear Actuators - Del-Tron Precision, Inc.
Miniature linear actuators operate in much the same way as a typical linear actuator, just on a much smaller scale. Most miniature linear actuators are electric, although some may use piezoelectric power for highly precise, short movement, and still others are pneumatic actuators. However, in terms of basic construction, miniature linear actuators consist of a base plate, stator, and a runner with guides on both sides, all of which are micro machined. In most cases, silicon is used as the base material. Miniature linear actuators are typically used in small spaces that require large payloads. When choosing a miniature linear actuator, several factors are important for its success in its application. For instance, the duty cycle accuracy and programmability requirements must also be measured, as well as the safety requirements, environmental concerns and space constraints. 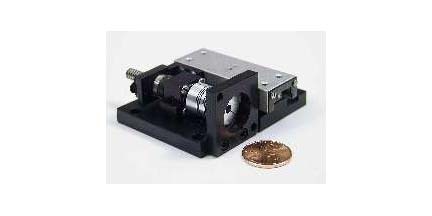 Since most miniature linear motors are electrically-powered, then many different available electric motors, including stepper, brushed DC or brushless servomotors, must be considered. In terms of piezoelectric-powered miniature linear motors, the linear motion results of from mechanical pressure that has been exerted on certain types of crystals, such as quartz or Rochelle salt. Pneumatic power, on the other hand, simply means that the miniature linear actuator is powered by air or gas pressure.